One of the biggest cranes in Europe was at work in Cornwall on Friday. 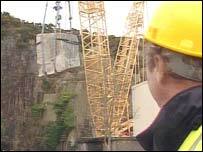 The machine lifted a 180-tonne piece of granite out of De Lank quarry on Bodmin Moor. The rock is to be transported to the Eden Project. The crane arrived last week on more than 30 lorries and then took a week to put together. The operation had been delayed because the huge piece of granite, four times bigger than the biggest at Stonehenge, turned out to be heavier than expected. The crane can easily manage the 180 tonnes, but the operators had to send for extra counterweights to deal with the 167 tonne rock. Sculptor Peter-Randall Page will spend a year turning the stone into a giant seed which will be the centrepiece of the new education building at the Eden Project.